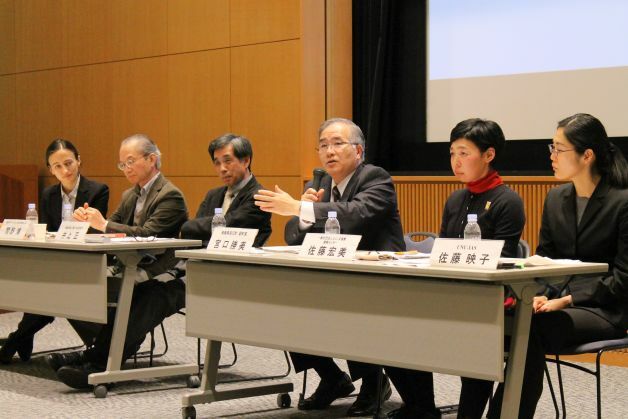 On 16 February 2016 UNU-IAS organized a public symposium in Fukushima city titled Human and Social Impacts of the Fukushima Daiichi Nuclear Disaster: What has been Learned and What Remains to be Learned?. The symposium presented and discussed research findings from the UNU-IAS Fukushima Global Communication (FGC) programme on issues of displacement, restoration of livelihoods and risk communication in the context of nuclear accidents. With over 60 participants, the event was also featured in the local and national media in Japan. Opening remarks were delivered by Kazuhiko Takeuchi (Senior Vice-Rector, UNU), who introduced the FGC programme, and Masao Uchibori (Governor, Fukushima Prefecture), who provided an overview of reconstruction progress in Fukushima. The opening remarks were followed by presentations from two FGC researchers. Ana Mosneaga (Research Associate, UNU-IAS) emphasized the need to recognize Fukushima’s evacuees as a case of internal displacement in need of durable solutions. Based on her field research, she highlighted the need for recovery policies to be informed by a thorough analysis of the diverse challenges faced by evacuees, and for support measures enabling people to find workable solutions to their situations until return, local integration or relocation become viable options. Akiko Sato (Research Associate, UNU-IAS) highlighted key issues in current risk communication practices, including the need for comprehensive information about radioactive contamination and exposure, the uncertainties that exist in radiological science, diverse perceptions of radiation risks, the range of information needs for disaster recovery, and information disparities. She stressed the need for support mechanisms to assist affected people in utilizing radiation data in their daily lives and understanding disagreements in the radiological sciences, and to address information disparities. A subsequent panel discussion brought a wide range of perspectives from academia, government and civil society organizations. Audience members also participated in the discussion, suggesting that risk communication should be an integral part of disaster risk reduction efforts, and emphasizing the need to communicate and reflect on the experience of Fukushima globally. Panellists highlighted the importance of providing accurate information and understanding that risk perception was ultimately a matter of individual subjectivity. They called for support measures to be provided until affected people were able to feel safe, and emphasized that recovery and reconstruction would take time and that shortcuts were not possible. The need for public involvement was underlined, as well as continued analysis of the situation and dissemination of findings to ensure that lessons from the nuclear disaster were learned — both in Japan and in other countries. A detailed report on the symposium is available. This event was organized as part of the UNU-IAS Fukushima Global Communication programme, a research initiative examining impacts of the Great East Japan Earthquake, tsunami and nuclear accident of 11 March, 2011 on people and society, the challenges of the recovery process in Fukushima, and related issues of risk and information provision.